We know that salary, the relationship the employee has with their boss and/or other employees, and other intangibles affect success in the workplace. But do the physical surroundings have an effect on the overall productivity of a work place? At Full Sail Graphics & Marketing, we say yes. Everyone does their best work under slightly different conditions, but the overarching concept is that cognitive productivity is dependent on the surrounding environment. Different cultures even provide specific sets of guidelines determining how best to harmonize everyone with their surrounding environment. The ancient Chinese philosophy of Feng Shui is a prime example of this concept. Google is notorious for believing in the necessary link between a stellar workplace and stellar work. In his book, Work Rules!, Google HR boss Laszlo Bock explains the key to Google’s success as a company is constant innovation, experimentation, and fun. The workplace readily reflects these ideals. Employees at Google are free to design their own workplace and truly make it their own. The theory behind this freedom is that employees will perform their best work when in their own ideal work environment. Sure, Google might have what is considered to be one of the most impressive business environments. But, that does not mean that other businesses must be excluded from the trend. With the rise in wall graphics, window graphics, signs and banners, it is easier than ever to transform a somewhat bland workplace into an inspiring work of art. An aesthetically pleasing workplace can increase employee creativity, productivity, and efficiency. Impressive graphics unlock creative potential and foster innovative ideas. Eighty-three percent of employees interviewed in a related study felt that the artwork displayed in their office space affected the work that they did. Those same employees believe that their quality of work would change if those graphics were no longer present. Wall or window graphics have the added benefit of impressing visitors and creating a more welcoming environment. 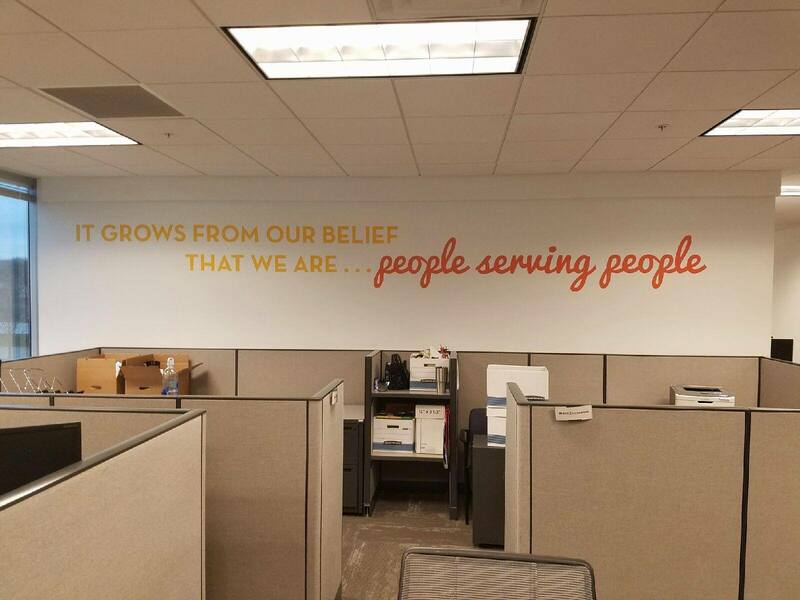 Wall graphics and banners even assist in connecting with clients on an emotional level by using graphics that connect with the customer demographic. For example, a pet store showing graphics of people happily playing with pets is likely to resonate with the customers. Signs such as those may even be the extra motivation a customer needs to make a purchase. If customer and employee satisfaction is not enough, wall graphics and banners can help to foster a particular brand name, company slogan or tagline. If your company wants to be represented by a particular trademark, like “Just Do It” or “I’m Lovin’ It”, having that tagline as a wall graphic in the workplace will increase its popularity as a phrase. This strong sense of branding, in turn, fosters a higher level of trust in the product represented by the brand. Trust therefore leads to increased business. Wall graphics, window graphics, and banners are not an entirely new concept. However, their effects on employee productivity, customer engagement, and branding cannot be ignored. With over 50 years of combined experience in graphics and marketing, the Full Sail Graphics team is confident that we will deliver quality graphics on time and on budget. If you’re looking to improve your work place, please feel free to give us a call at (714) 274-6706 or visit our website at //fullsailgraphics.com.